South Korean Navy Incheon-class guided missile frigate underway. A variant will soon be equipping the Philippine Navy. Photo Korean DoD. The Philippine Navy ( PN ) has finally woken up from its delusion that a charging Duterte on a Jet Ski could help reclaim the Scarborough Shoal, or the Mischief Reef, or any of the numerous disputed low tide elevations, rocks and islands in the Spratly Island Group. For the first time in many decades, it is actually coughing out serious dough to acquire new build GUIDED MISSILE frigates, a.k.a. FFG, proper modern surface combatants that can at least stand a chance of surviving a hostile encounter with the ultra-advanced frigates and destroyers of the South Seas Fleet of the People's Liberation Army Navy ( PLAN ). More importantly, the possibility of afflicting real damage to any belligerent enemy naval unit means that the new frigates will bring some deterrent value to the PN. Two frigates will never be sufficient to counter an entire fleet but it is a step in the right direction. Admitting that Jet Skis would not work is an important and brave move on the part of the PN. Look at it this way, any soldier who dares to stand up against the words of his presidente and tell the truth while risking his own rice bowl or maybe even his life is commendable. We have a glimpse of what the future holds for the courageous men and women of the PN, who unfortunately are lead by a NSB ( Not So Bright ), d***headed and foul-mouthed commander-in-chief. 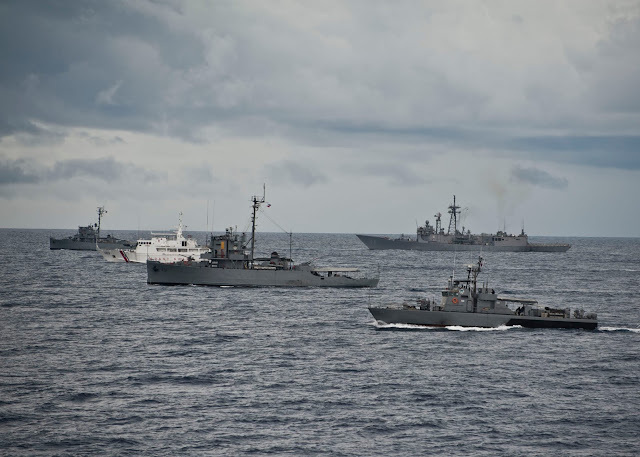 As mentioned before, the Philippine Navy operates a mishmash of obsolete warships donated by friendly nations or bought second-hand on the cheap, some of which have histories going back to World War II! 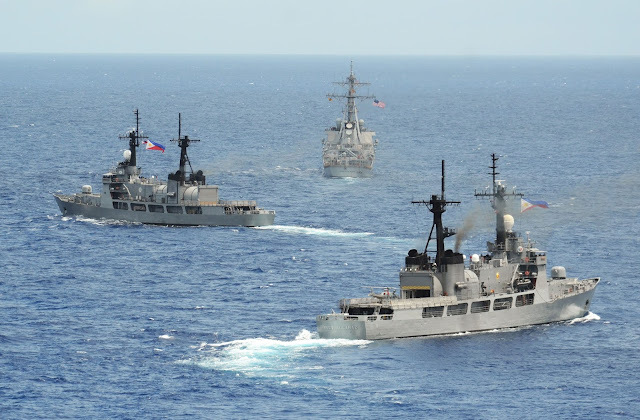 Up to now, their most impressive man-of-war is a trio ( PF-17 BRP Andres Bonifacio was transferred to the PN on 21st Jul 2016 ) of the ex-US Coast Guard Hamilton-class cutters bought from the Unite States under the Foreign Military Sale program through the Foreign Assistance Act. These so called high endurance cutters have already seen more than 40 years of service with the USCG before being retired and have all been promoted to frigates in the PN! This despite the fact that they are only armed with a 76mm Oto Melara gun, a 25mm autocannon and half a dozen Ma Deuce type machine guns ... limited anti-submarine warfare ( ASW ) capabilities, no missiles, no close-in weapons system ( CIWS ). Without the proper equipment and support, a tall order for any admiral or sailor. A ragtag flotilla of small boats belonging to the PN and PCG during CARAT 2012. PCG Pampanga (SARV 003) and BRP IloIlo (PS 32). It has been considered the weakest among the South East Asian navies for years, partly a victim of successions of corrupt and/or ineffective leadership that had emptied the coffers of the nation. It didn't help when at one time the Philippines decided to focus its military resources on internal security and fighting Islamic insurgents at the expense of countering external threats to its exclusive economic zone ( EEZ ) and sovereignty. It was only after losing Mischief Reef and Scarborough Shoal to China that the Filipinos finally realized the dire state of their military and resolved to embark on a renewed Armed Forces of the Philippines ( AFP ) modernization program, the previous effort having failed during the Asian Financial Crisis of 1997. In Dec 2012, under the administration of Benigno Aquino III, Congress passed the Republic Act No. 10349, a.k.a. the revised AFP modernization act which extends the modernization program for another 15 years with a budget of PHP 75 billion for the first 5 years. All 3 services of the armed forces would benefit from this upgrading effort. Now, almost 4 years on, we are beginning to see the results of some of these early efforts. The Philippines Air Force had began receiving some of their brand new FA-50 fighters from Korea ( 12 ordered, more considered ) and also their AugustaWestland AW-109 helicopters ( 8 ordered ). The Philippines Army meanwhile gets 114 M-113A2 armoured personnel carriers from ex-US stocks and tens of thousands of new M-4 carbines, RPGs and howitzers. 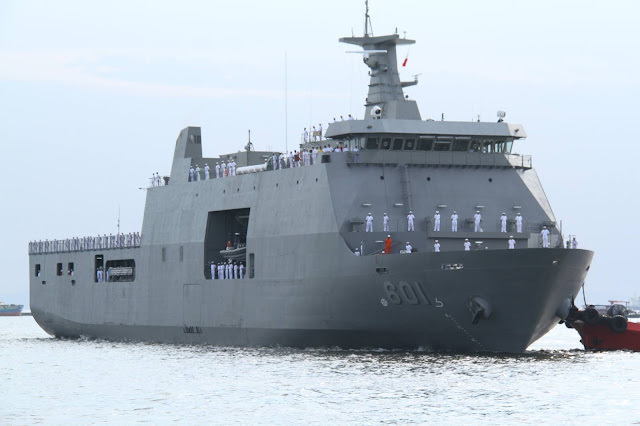 For the PN, modernization came in the form of a brand new Landing Platform Dock, the BRP Tarlac, built by Indonesia based on their successful Makassar-class LPD which in turn has Korean origins. It is relatively huge at 11583 tons full load but is only armed with guns and does not have any CIWS installed. The first-in-class LD-601 BRP Tarlac was delivered to the PN only in May this year and was commissioned on 1st Jun 2016 while the second-in-class BRP Davao Del Sur ( LD-602 ) had just been launched on 29th Sep and will be due in 2017. Each ship is said to cost $46 million sans weapons and sensors. They are also known as Strategic Sealift Vessels ( SSV ) in the Philippines. 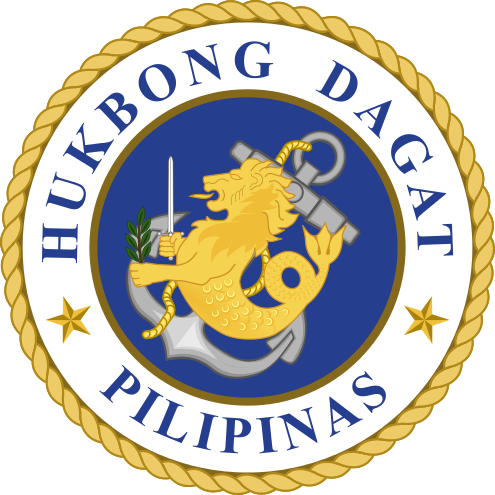 Also, just last month the Philippine Department of National Defense ( DND ) revealed that the frigate acquisition program launched in Oct 2013 was being finalized. The PN will be getting two modern guided missile frigates or FFGs based on Hyundai Heavy Industries' HDF-3000 multi-purpose frigate design which has been used as the basis for the Republic of Korea Navy's ( RoKN ) Incheon-class frigate. The Incheon-class is also collectively known as the FFX-I frigate. 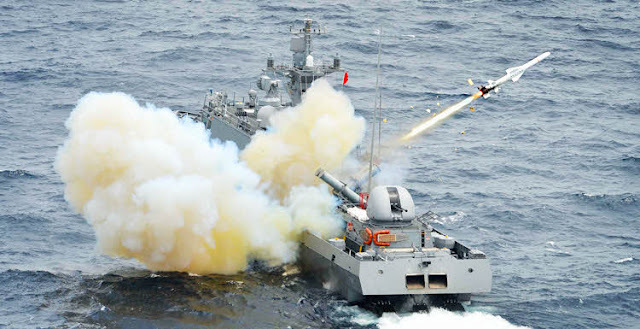 fires its main gun while leading a pack of smaller vessels 15th Jan 2016. 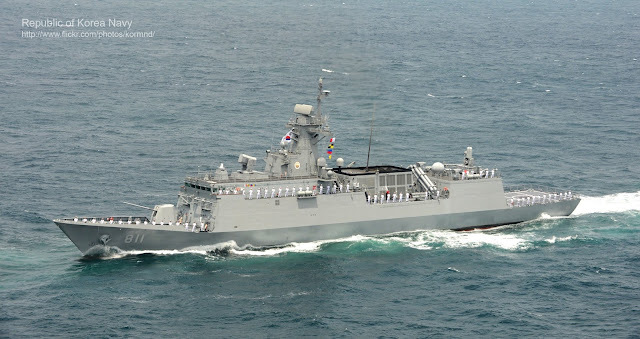 It is also worth mentioning that the PN is due to receive a decommissioned Pohang-class patrol combat corvette the ex-ROKS Mokpo ( PCC-759 ) as a recognition of the contribution of Filipino troops during the Korean War. This anti-surface warfare ( ASuW ) version of the Pohang-class corvette is armed with the Aerospatiale ( now MBDA ) MM-38 anti-ship missile ( AShM ), an obsolete version of the Exocet AShM made famous during the Falklands War. Depending on how soon it can be refurbished and handed over, supposedly with all the weapons and sensors intact, this can become the PN's first missile armed combatant. In any case, the PN will soon be entering the missile era, close to fifty years after the rest of the world realized the potential of AShMs with the sinking of the Israeli destroyer INS Eilat by Egyptian fast attack missile boats. Like they always say, better late than never. ROKS Jinju ( PCC-763 ), a Pohang-class corvette in a photo dated 19th Oct 2015. The HDF-3000 multi-purpose frigate is Hyundai Heavy Industries' winning design for the Republic of Korea Navy's ( ROKN a.k.a. South Korean Navy ) Future Frigate eXperimental ( FFX ) Program. 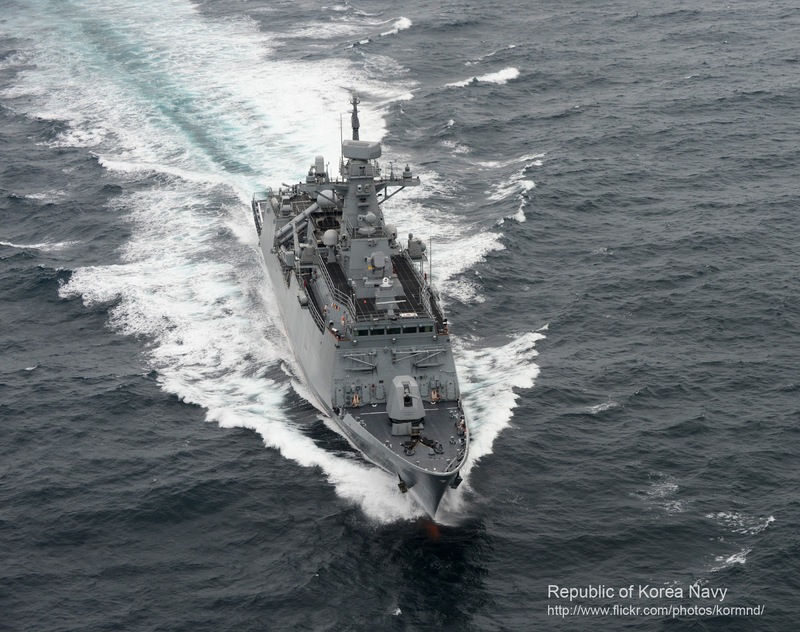 The ROKN has a requirement to replace its fleet of ageing Ulsan-class light frigate, Pohang-class general purpose corvettes and Donghae-class coastal corvettes, a total of 37 vessels all commissioned in the early eighties and rapidly approaching the end of their service life. The original plan was to build a smaller number of more capable ships to replace the older vessels, namely 24 guided missile frigates ( FFG ) in the 3000 ton class. And just like their earlier destroyer acquisition project the Korean Destroyer eXperimental ( KDX ) Program, the ROKN decided to split the procurement of their future frigates into 3 batches, with each successive generation incorporating the lessons learnt during the construction of the previous batch. The FFX Program was initiated in the early 2000s and by the time the Batch I ( FFX-I ) design was finalized, the frigate had its tonnage reduced to 2300 tons. A total of 6 ships will be produced and the construction of the first frigate was awarded to Hyundai Heavy Industries ( HHI ) in 2010. Today the FFX Batch I frigates are of course known as the Incheon-class FFG following the naming of the first-in-class the ROKS Incheon. It was launched on 29th Apr 2011 and commissioned on 17th Jan 2013. HHI would also go on to build the second and third frigate but the construction of the last three ships was awarded to STX Offshore And Shipbuilding. The first 5 frigates are already in active service with the ROKN while the last frigate will be commissioned by the end of the year. Each FFX Batch I frigate is said to cost USD 232 million. 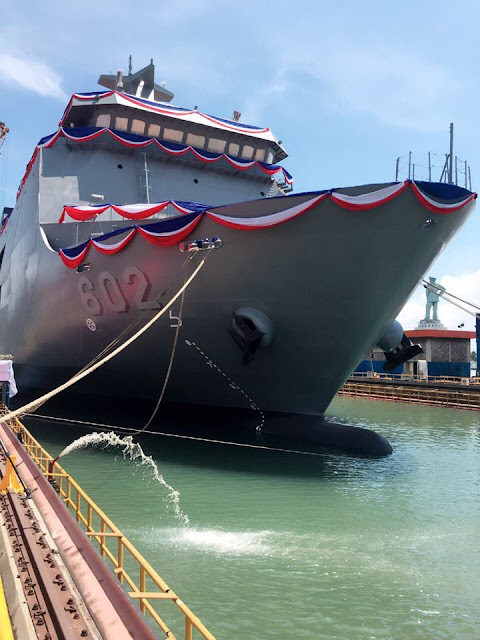 Meanwhile, construction of the first FFX Batch II frigate ROKS Daegu had already commenced at Daewoo Shipbuilding And Marine Engineering in 2015. The eventual number of FFX frigates procured will be between 18 to 24 vessels, all by the year 2020. ROKS Incheon ( FFG-811 ), the first of Korea's FFX-I guided missile frigate class. The HDF-3000 frigate has only a somewhat stealthy hull and superstructure design with reduced acoustic and infrared signatures due to cost constrains. Compared to the older corvettes and frigates that it is supposed to replace, these next generation frigates are definitely much more capable, especially in the area of self-protection. In Mar 2010, the sinking of the ROKS Cheonan by a torpedo from a North Korean submarine is a stark reminder of the importance of ship defense systems. The Cheonan is a Pohang-class corvette which the FFX was meant to replace. The new frigates will have both gun and missile based close-in weapon systems against precision munitions, AShMs, hostile aircrafts, UAVs and small boats. Batch I vessels will however not be installed with any torpedo and acoustics countermeasures ( TACM ) system. That will have to wait till Batch II and beyond. The relatively large 5 inch ( 127mm ) main gun with its greater range is good for providing naval gunfire support during amphibious landings by the Marines. A hull-mounted sonar and two triple torpedo launchers plus the naval helicopter gives these frigate credible ASW capabilities. The addition of a towed array sonar system ( TASS ) in Batch II will further enhance the submarine hunting capabilities of these frigates. The two quadruple launcher for the LIG Nex1 C-Star ( Hae Sung ) AShM gives the frigates a long range strike capability against surface vessels up to 150km away, a slight increase in range compared to the Harpoon missile. Batch II frigates will be installed with the Hae Sung II which features GPS/INS guidance and land attack capability. 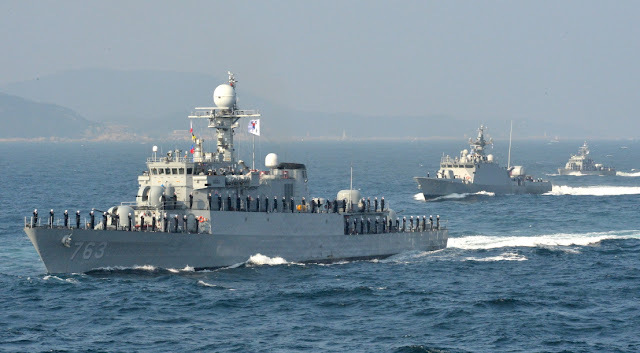 The ROKN has now also decided to retrofit the Batch I frigates with the Hae Sung II. In essence, just by looking at the technical specifications, the Incheon-class FFX Batch I frigates can be considered low-end inshore general purpose frigates, built specifically for the ROKN to counter the North Korean threat which is largely littoral in nature. Apart from the lack of a TASS and a TACM system, the other glaring shortfall is their lack of medium or long range surface-to-air missiles to provide a broader air defense capabilities beyond self-protection. Then again, these frigates are supposed to operate in coastal waters close to home where they can enjoy the protection of the Republic of Korean Air Force ( ROKAF ) and ground based air defense units. 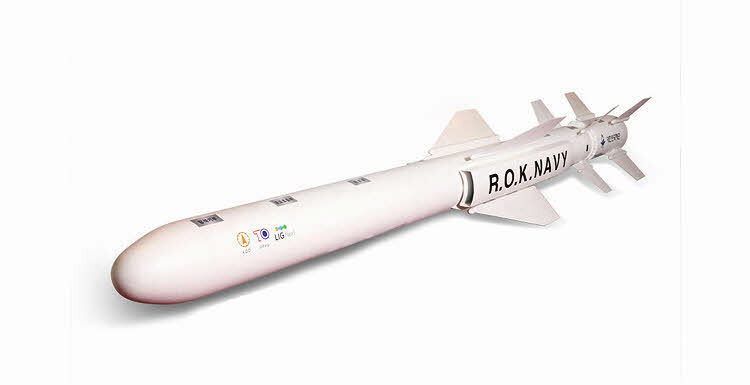 They can also rely on the air defense umbrella provided by the ROKN's better equipped KDX destroyers and the FFX Batch II frigates which will have the longer ranged K-SAAM missiles in vertical launchers. Having considered and eventually dropping the idea of buying two refurbished Italian Navy Maestrale-class frigates due largely to the perceived increase in maintenance costs for older ships, the Philippine Department of National Defense launched this two-ship Frigate Acquisition Project in October 2013 to fulfill the PN's long-range maritime surveillance, patrol, and interdiction requirements. 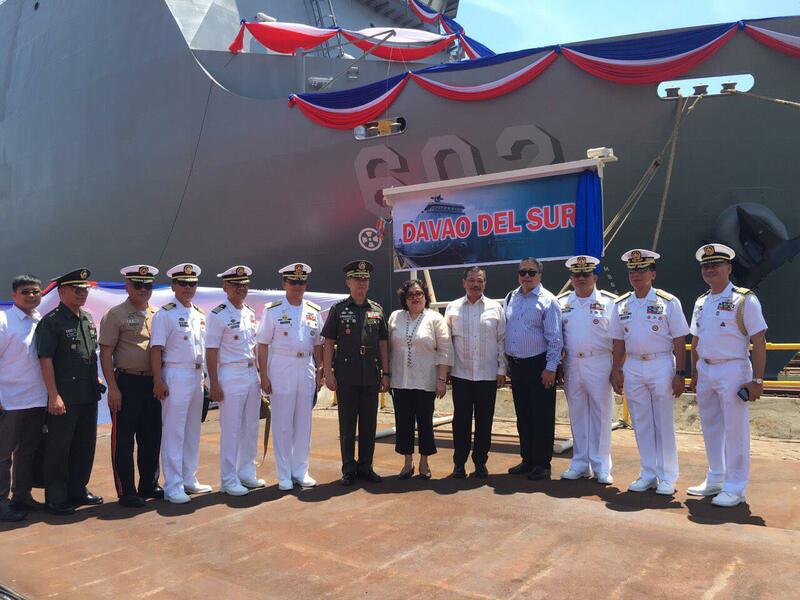 It had been allocated PHP 18 billion in total for the project, PHP 16 billion for the construction of the frigates and PHP 2 billion for the munitions. 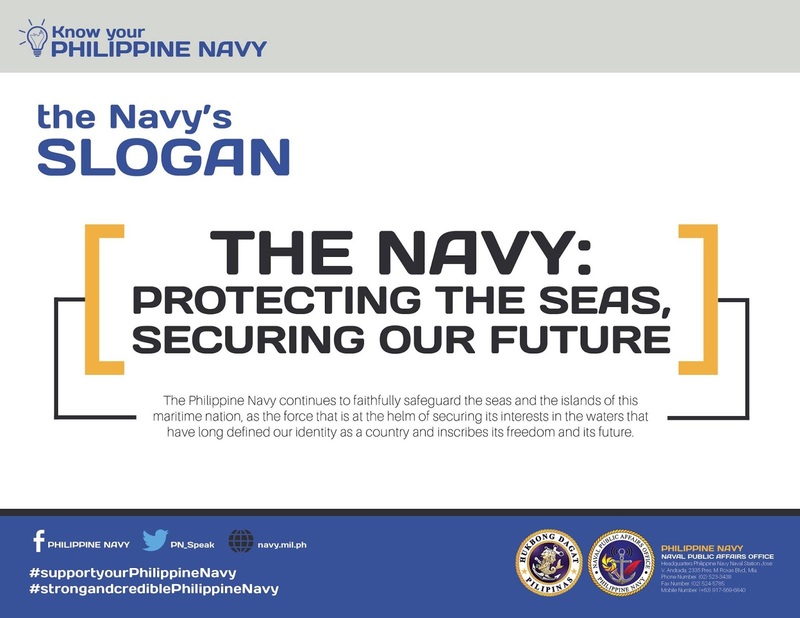 Credit has to go to the previous Aquino Administration for initiating this long overdue revamp of the navy. There were several contenders for the project initially and they include Navantia of Spain with its Avante 2200 Combatant , STX France with its modified Floreal-class offering, Garden Reach Shipbuilds and Engineers of Kolkata with its modified Kamorta-class ASW corvette, Daewoo Shipbuilding and Marine Engineering with ? FFX-II and of course Hyundai Heavy Industries with the modified HDF-3000 Incheon-class FFX design. All had to modify their designs one way or other to suit the operational requirements and the budget of the PN. Needless to say, each have their own strengths and weaknesses and it was up to the PN to evaluate and decide which would be of most value. The program had already gone through the first round of bidding in Dec 2013 but suffered the usual delays commonly encountered in the defense procurement processes in the Philippines, namely administrative and financial hurdles. After two years of waiting, it somehow got kick-started again in December 2015 when then President Aquino gave the final approval for the DND to initiate a new tender process with a revised technical specifications list that filled 71 pages. Here's a summary of what the DND wanted. Two new construction multi-mission frigates for Anti-Air Warfare ( AAW ), Anti-Surface Warfare ( ASuW ), Anti-Submarine Warfare ( ASW ) and Electronic Warfare ( EW ) operations. They must be at least 95m in length and not less than 2000 tons. They must have an endurance of 4500 nautical miles at 15 knots and able to sustain 30 days of operations at sea. For engines, the DND asked for Combined Diesel and Diesel Configuration ( CADAD ). The frigates will have to incorporate stealth characteristics to reduce their radar, infra-red and acoustic signatures. The vessels will also have additional space and power to cater for the future installation of an 8-cell vertical launch system ( VLS ) for surface-to-air missiles ( SAM ), close-in weapons system ( CIWS ) and a Towed Array Sonar ( TAS ) system. They will have a hangar to accommodate a 10 ton and the ability to embark a 12 ton helicopter. 76mm main gun capable of engaging air and surface targets at a burst rate of 120 rounds per min. There were only four bidders for the second and final round. The outcome of the bidding was such that Daewoo and Navantia were eliminated early due to their failure to submit all necessary documents. GRSE submitted the lowest bid, at PHP 15.047 billion ( then USD 324 million ), but was disqualified for failure to comply with the Net Financial Contracting Capacity requirement, an indicator used by the government to gauge a contractor's ability to fulfill a contract. HHI was the second lowest bidder at PHP 15.744 billion ( USD 341 million ) and survived the post qualification scrutiny and thus was declared the winner. There is a saying, when you pay peanuts, you get monkeys. The Incheon-class frigates cost USD 232 million each. 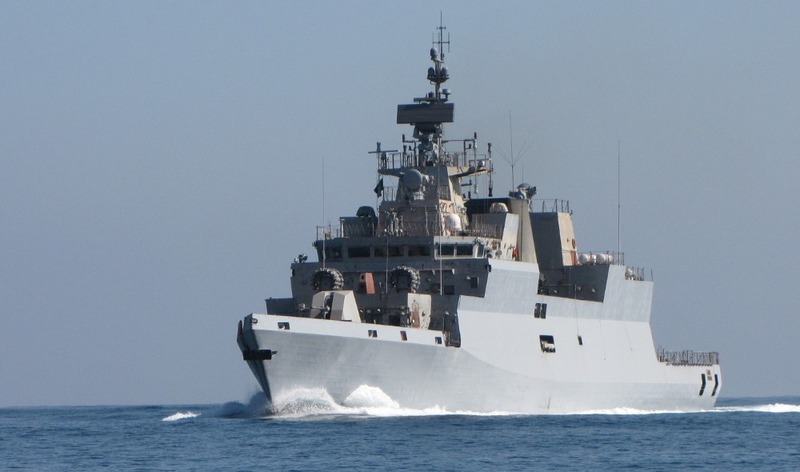 The DND is paying USD 341 million for two frigates, so some features had to be given up for sure. What the final configuration of the frigates will be only the PN and Duterte knows for now. The specifications list contained all the signs of penny pinching, like having all-diesel engines instead of the more common and versatile gas turbine-diesel combination. Gas turbines may be more expensive to operate compared with diesel engines but they are essential for the rapid acceleration and the high speed dashes during combat. Some of these cost cutting measures may even have a direct impact on the ability of the frigates to fulfill their intended roles, like asking for very short range air defense missiles ( 6km ?! ) when the frigates were supposed to conduct Anti-Air Warfare? The 8 cell VLS is a distant proposition that may or may not happen, depending on you guessed it, available funds. All it takes is another monster typhoon to crush that future upgrade. And with global warming these once in a century super storms are occurring two or three times annually. Also, with the frigates fitted for but not with a CIWS, they are just sitting ducks for the YJ-8 ( C-802 ) and YJ-18 AShM from the Chinese fleet at the outbreak of hostilities. It could be a case of being penny wise but pound foolish, or shall we say, sentimo wise but piso foolish, where failure to install a USD 8 million Phalanx CIWS ( or other missile-based CIWS ) might have resulted in the loss of a USD 170 million frigate. 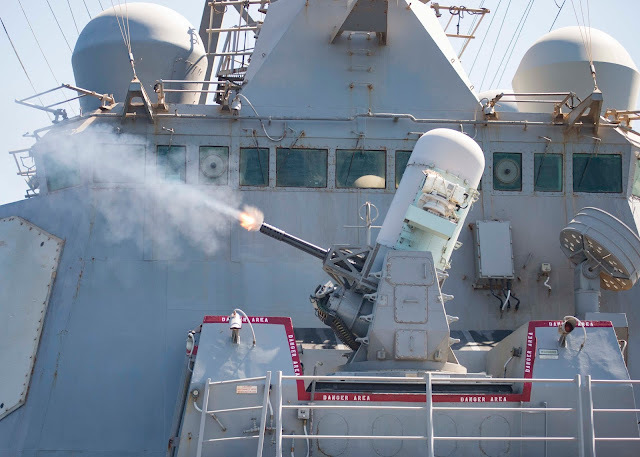 The Phalanx CIWS in action onboard USS Stout ( DDG-55 ). That said, even a watered down FFX-I frigate is a vast improvement on the current line up of the guns-only vessels of the Philippine Navy fleet. When they are delivered, hopefully by the year 2020, the PN will have to rapidly integrate the new frigates into the fleet and attain proficiency in operating the new weapon systems that come with the frigates. The admiralty will have to develop new tactics and joint operations doctrines and put the newly acquired frigates to good use. A stronger PN is not only good for the Philippines but also good for the stability of the region, and will be a useful deterrence against further Chinese expansion in the South China Sea. 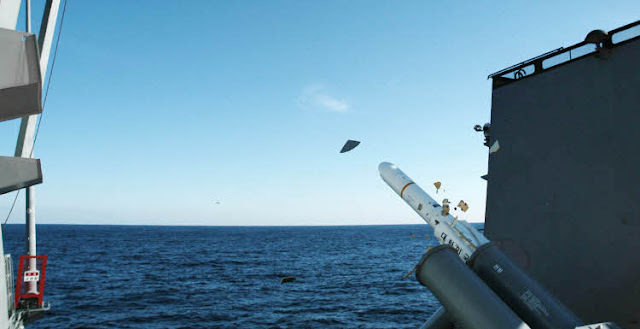 Lastly, it's just as well the PN frigates won't be equipped with land attack cruise missiles. The constant worry is that Madman Duterte, having lost his beloved Jet Ski, might decide to appropriate the frigates and use them against the estimated 3 million drug peddlers and petty criminals of his own country. Death by 76mm HE. That for sure will escalate the War against Drugs of the Philippines to a whole new level. In my Opinion, the Philippines should have asked for the aging used Ulsan-class light frigate, Pohang-class general purpose corvettes and Donghae-class coastal corvettes. At least those ships could bring them up to the Late 60's and 70's era Navy. The other option for them is, if they want a Fully Loaded frigate, Russia is one option as well, such as the Talwar Class frigate & the Admiral Grigorovich-class frigate, Admiral Gorshkov-class frigate or the Steregushchiy-class corvette. 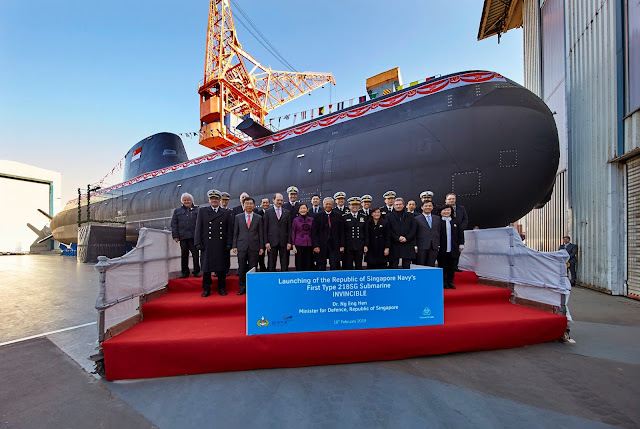 Since the Philippines wants Submarines, they can even talk to Russia on the Improved Kilo class SSK or the Amur class SSK. That could well be the real motive of gifting the Mokpo to the PN, in the hope that they might actually end up BUYING more of the Pohang-class corvettes as the ROKN retires them in the next few years. But what the PN really needs is an entire squadron of the FFX in its original ROKN configuration and not the fitted for but not with nonsense. The issue with the FFX is that the FFX has US Made weapons and systems. Which means the US can block the sale of the FFX to the Philippines. Which is why I think the ROKN should have offered the aging used Ulsan-class light frigate, Pohang-class general purpose corvettes and Donghae-class coastal corvettes to help build up their Navy. At the same time the PN should talk to Russia on the Talwar Class frigate & the Admiral Grigorovich-class frigate, Admiral Gorshkov-class frigate or the Steregushchiy-class corvette because Russia can give them everything including the weapons systems. The US will only ban the sale of weapons with US-made components to the PH only if Duterte uses them to kill his own people. In any case, most of the weapons and sensor systems of the FFX are indigenously sourced from the S Korean defense industry. Duterte may not be too bright but his lieutenants added a clause in the tender documents ( Pg 66 ), in effect saying that the PH shall own the frigate design or shall be granted a license to produce it. With that, the PH can even begin exporting the FFG to other needy countries, just like what Indonesia is doing with their Makassar-class LPD. Another clause says SAM, SSM and torpedo supplier country must have existing MOU on logistics and defense industry corporation with PH or otherwise maintains diplomatic relations with the PH ( Pg 30 ). The PH already had that covered. No but I wouldn't be surprised. I would've done the same if I were Obama. In the light of Duterte's just declared pivot to China, maybe S Korea should reconsider the FFX sale least all its missile and sensor technology fall into the hands of China. Modi must have been relieved that GRSE lost the deal. 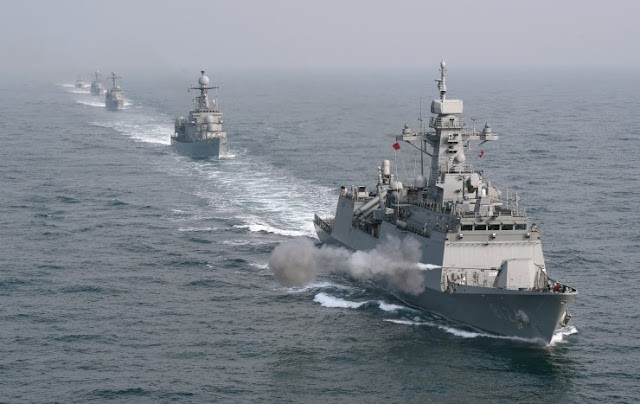 If I were SK, instead of giving them the Incheon class Frigate, I would give them the older Ulsan-class light frigate, Pohang-class general purpose corvettes and Donghae-class coastal corvettes. That way, China doesn't get the Sk technology and all they get is older gear.